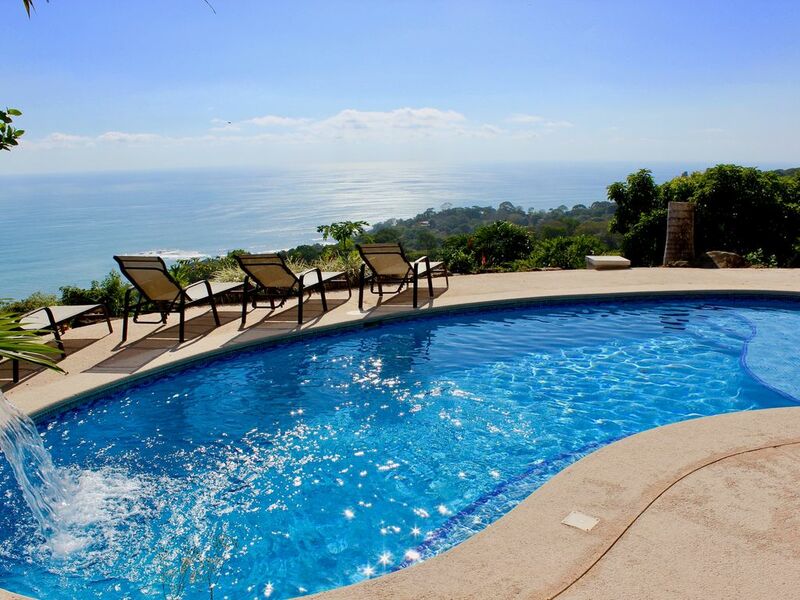 Beautiful villa in Escaleras Hills, 10 minutes south of Dominical; 200 km or a 3 hour drive from San Jose. Nestled on the edge of the rain forest with a breathtaking, panoramic view of the Pacific amidst a lush, green forest 1,200 feet above sea level, the villa has four tastefully decorated bedrooms with queen size beds. An extra bedroom with a pair of twin size beds can accommodate two additional guests. The house has two and a half baths, including a shower in the master bathroom that also overlooks the scenery. The living room opens up to the terrace and a 180 degree view. The Villa comes equipped with Direct TV & bluetooth audiosysteem. Private meals and daily maid services available. english, french, german, italian, dutch, Attention: European time, 6 hours later!! Hello, I am Peter. I am grown up in the beautiful city of Utrecht, located in the center of the Netherlands. I have had for many years my own business in this city. Have been travelling a lot and still do! The villa in Costa Rica is my second home. Puravida! I have ben traveling for many times in Costa Rica. So when I was on the most beautiful spot , I wanted to be sure to go overthere as many as possible. So I bought a villa in Escaleras. Prices do not include meals but full service breakfast and dinner is available for an additional charge. Prices subject to change without notice. This home was so much nicer than the pictures showed. It was immaculate, super clean and nice. Our family of 8 had plenty of room to stay and play. The view is breathtaking to say the least. The pool overlooking the ocean was our favorite part. We miss that view and wish we could come back! If you’re looking for a great home to stay in with plenty to see and do all around you, that’s safe, clean and big...then this is the place. The owner Peter was great during the booking process and answered every question we had. We will be back! Pura Vida! It was my second time in Costa Rica and a second time in Dominical/Uvita area. Me and my family really enjoyed our stay at Tierra Verde. Villa is in a very good condition, very well maintained, pool is nice and clean. There is a person that is coming every morning to clean it and also takes care of a beautiful garden on a property. Pictures absolutely make no justice for a property which is bigger and way more beautiful in person. Peter is a very nice person, I recommend You to follow all of his advises and visit places he recommends in his Welcome letter after You book his beautiful property. Thank you Dmitriy! Pura vida! We loved out stay at Tierra Verde! House and views are better than the pictures. Breathtaking views, wildlife, nice gardens and very private. The owner is very attentive and polite. He answers all your concerns and goes all the way to make sure you have what you need. The house is clean, well taken care of, a fully equipped kitchen, clean pool, a very comfy ranch, wireless internet, and linens. The open space kitchen allows you to be part of the fun while cooking. Wildlife is all around, birds, sloths, monkeys. Amazing! There’s a lot to do around like hiking, visiting the waterfalls, the beaches, surfing, take the tours to see whales or dolphin(Seasonal). We are looking forward to our next visit! We had viewed the pictures of Tierra Verde quite a few times while surviving winter and waiting for our February getaway. The actual house and views exceeded our expectations. The house is large and spacious. The indoor/outdoor living areas blend seamlessly. It is tastefully decorated and the furniture is stylish AND comfortable. There are outstanding views from almost all rooms. Everything you need is provided. The bedrooms are on the lower level and all have access to the outside living areas. They are bright and have views of the ocean or the pool.There are 3 bedrooms with queen beds and plenty of closet space. There are 2 bathrooms on this level. One is ensuite with the largest bedroom and the other is smaller and available to the other 2 bedrooms. The washer and dryer are on this level also. The top floor has the kitchen , dining and living area. There is a half bath and another room with twin beds and a wonderful balcony with hammock. There some neighbors but you see no one and a have a very private house and yard. The pool area was wonderful. There is plenty of shade to get out of the hot Costa Rican sun. Lots of place to enjoy outdoor dining. This was our 3rd trip to Costa Rica, but we had never been to Dominical before. It was a lush beautiful area without crowds. My grandchildren enjoyed surf lessons all week,( Dominicalito Beach with Sunset surf.) We did some other exploring( waterfalls, river rafting , and Hacienda Baru) but they( the grandchildren) were content just to enjoy the pool. Grammy's favorite spot was the couch on the upper outdoor balcony. The views and the breeze wonderful. We did get to see toucans from our balcony, and of course the howlers seranaded us every morning. I would recommend this house to any large groups. You will never feel crowded. Peter , the owner, has a nearby manager. Barbara is available if you have any problems. So you are not completely on your own. We all can't live in paradise, but we can rent it. We loved out stay at Terre Verde! We would return here for sure! The house is much better than the photos. Breathtaking views, very private, lots of space, wonderful pool, fully equipped kitchen, wireless internet access and wildlife all around you! We saw toucans and slothes almost every day right there from our balcony or by the pool. You will definitely need a four wheel drive to get up the steep, long dirt road but it’s well worth the drive. We cooked most evenings since the kitchen was wonderful. We found a great local place to buy seafood right at someone’s home in town. Once you are in town follow the dirt road along the river, under the bridge and turn right after a hotel. You will see a sign for Pescatoria. The seafood was amazing, local, fresh and inexpensive. If you can’t find it ask at one of the small grocery stores in town because they are the ones that told us about it. We went to three beautiful waterfalls which were all easy to get to without much hiking - Pozo Azul Waterfalls in Dominical, Uvita Waterfall and a private waterfalls on a farm near the Talapia farms in Ojochal. Our favorite beach was Playa Ventanas, windows beach which gets its name from the sea caves that during high tide blow out gusts of air and water. It was amazing. I think at low tide you can even go into the caves. The town of Dominical was very low key and fun. Don’t except anything fancy here it’s very beachy, hippy and relaxed just what we were looking for. We ate lunch at Tortilla Flats which is a must do. Tried surfing but the waves were huge. It was fun to watch all the experiences surfers though. There was a nice open restaurant at the end of the strip on the beach that we had breakfast at which was very good. In Uvita we found a wonderful bakery at the end of our trip. Wish we would have known about it earlier as the empanada were wonderful as well as the pastries and bread. Loved Dominical but especially loved our stay at Terre Verde! The owner of this property had given us plenty of information prior to arriving in San Jose Costa Rica - many restaurant recommendations - things to do in the Dominical area, driving directions, and information about the house. We arrived in San Jose on April 8th but did not make it to the house until the evening of the 9th due to rental car issues. Once we arrived at the house we found it to be very nice. I have stayed in the same area on previous visits to Costa Rica and found this house to be very well suited for a week or longer stay. Great views inside and outside, the pool area is clean, the house has a great floor plan with 3 bedrooms down stairs and 1 bedroom up stairs. the kitchen is open to the dining area and the living area. Nice furniture around the pool with great views. I will definitely stay here again. * Payment and Cancellation Policy: 50% due within 14 days of reservation. Final balance due 30 days prior to arrival * Refund less 15% will be given with minimum 30 days notice. * Discount available for parties less than 4.